Miranda and Maude don't see eye-to-eye about much and a friendship seems unlikely, but sometimes those who are different from us make the best types of friends. Miranda is a princess who is being forced to go to school for the first time and is not very interested in school work or socializing with her classmates. Maude wants to be a social justice activist when she grows up and loves learning. Miranda is disgusted by Maude's love of hard-boiled eggs. Maude thinks Miranda's rudeness is a social injustice. When Miranda has a royal birthday party, their differences come to a head and both girls treat each other unfairly. It turns out that the girls have something in common, an empathetic side that leads them past their misunderstandings. This book is both humorous and sweet. Miranda and Maude both have interesting and quirky personalities. Their annoyance with each other at the beginning of the book is amusing, especially when they try to one-up each other with a collection of artifacts on their desks. The story is also heart-warming, as the girls develop a friendship and learn to embrace each others' differences. 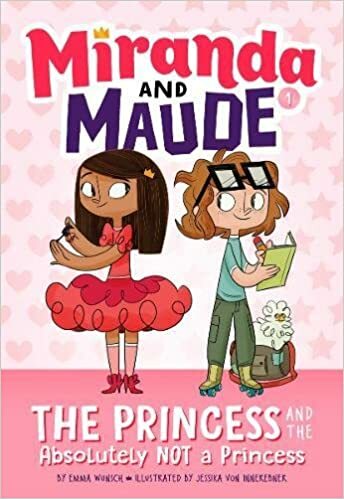 The Princess and the Absolutely Not a Princess is not only entertaining, but it can also help readers learn something about navigating relationships with their peers. The story shows that understanding differences and being empathetic are important in forming friendships. With short chapters and illustrations, this book will suit readers who are transitioning to chapter books. This is the first in a series that promises more fun adventures with two delightful characters. Thanks to the publisher, Abrams Books, for providing my book review group, #BookExcursion, with a copy of the book. The book publishes in August.